Does Receding Hairline from the Side Only? 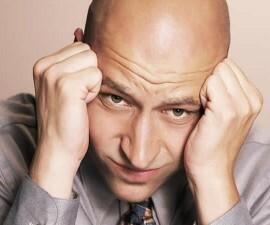 In general, receding hairline is a common early sign found in men with male pattern baldness (MPB). It is very rare in women with female pattern baldness (FPB). At first, it affects the temple (typically both front hairlines at the same time). Over time, it may worsen which then may cause M-shape or even partial /complete baldness. But does it from the side only? 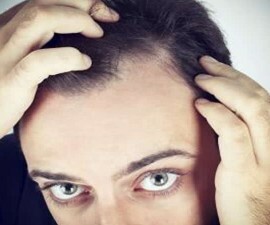 Male pattern baldness is the most common hair loss problem in men. The early sign (such as receding hairline) usually starts around the late 20s or early 30s, though in rare cases it may also occur in young adults. It may be a hereditary condition. If you have a family history of MPB, you are at greater risk than others to develop the same condition. But the same doesn’t go for women with FPB. FPB usually occurs with thinning hair on all over the head. It’s rare to find receding hairline at early stages of FPB. Moreover, the cause is more difficult to understand. And it seems that the problem is not hereditary. The following are other common types of hair loss. It is a common kind of hair loss where there is usually widespread thinning of the hair, rather than specific thinning or bald patches. The affected area may feel thinner, but you are unlikely to lose it all. It is also unlikely to affect the body hair. The problem is attributed by several causes. Mostly, it is usually caused by the body reacting to the following factors: stress, hormonal changes, childbirth (intense physical stress), cancer (or other long-term illness), an acute short-term illness (like severe infection), side effects of some medications, or even a crash diet. It is a widespread hair loss that can affect any hair, including hairs of scalp, body, or even face. It is a common side effect from some cancer treatments such as radiation therapy and chemotherapy. The symptom starts to occur within a few weeks after you start the treatment. The good news, it is usually temporary. Your hair will grow back a few months after treatment. It is a kind of alopecia (hair loss) that is usually linked to another condition. It occurs when the hair follicle is completely destroyed by complications of certain condition, and the damage can be permanent. Conditions which can lead to scarring alopecia include lichen planus (a widespread itchy rash), scleroderma (a disorder that affects the supporting (connective) tissues of the body), frontal fibrosing alopecia (commonly found in post-menopausal women), and folliculitis decalvans (a rare hair loss problem, commonly found in men). It is a hair loss problem associated with autoimmune disorders (such as Down’s syndrome and type-1 diabetes). It is commonly characterized by spots of baldness, typically about the size and shape of a large coin. Young adults and teenagers are at high risk for this alopecia, though it can affect people of any ages. Fortunately it is usually not permanent, though it may fall again. The prognosis is likely to be dependent on how the body immune system reacts! The hair usually will grow back within several months. At first, it may grow back white and fine, but it will regain its normal color and thicken over time. The answer is dependent on the kind of receding hairline you’re talking about! 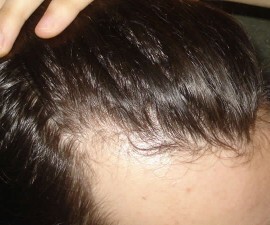 If it is a sign of male pattern baldness (MPB), typically it starts from the side (temple). Another early symptom of MPB is thinning on the crown. Both receding hairline and thinning hair on the crown can occur at the same time. But many times, at fist men with MPB experience receding-front hairline, which then may be followed by thinning on the crown. How to Stop Receding Hairline at Temples?